Yoshiko Sugita Middaugh passed away peacefully on September 24. She was born January 30, 1944 in Japan. She married George Middaugh there in August, 1961. Yoshiko spent her life raising her six children. Her family and her extended family was her greatest joy. She was a long term member of Soka-Gakkai International USA. 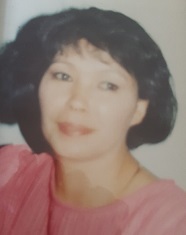 She is survived by her six children, Elizabeth Gable of Forreston, Il, Mary(Lee)Roark of Kansas City, Richard Middaugh of Grandview, Carolyn(Dwayne)Hall of Louisville, Ky, Steven Middaugh of Kansas City and Nancy(Steve)Ferrell of Liberty; 12 grandchildren and 4 great grandchildren plus many nieces and nephews. Also her special friend, Ted. Preceded in death by her husband, George. We truly sorry to hear her passing. We are still in shock that she is gone. We love you all so much and she will be missed by all. My mother and I were so sorry to hear of Yoshiko's passing; she was a joy to know. Thank you, Nancy for thinking of us at this time. Our condolences to all of you. Please know how saddened my mother and I are to learn of your mother's passing; she was a joy to know. Thank you, Nancy, for thinking of us. Our condolences to all of you.